VF-AS3 has two ports I/F of Ethernet as standard. Data of operating conditions and Dedicated data source can be stored to Big data and Cloud storage by Ethernet. Calendar / Time Stamp function Built-in Real time clock, Calendar and Event time stamp functions help operating data collection with actual time. VF-AS3 has a built-in Web Server function, and it can be easily accessed and manage the operating condition remotely from your PC or Smart Phone/tablet devices. For the advanced information and the event of drive fault, VF-AS3 displays the QR codes, which will provide immediate access to a dedicated web link for support and maintenance. For the installation, setup and maintenance, the video guidance is available with web support. 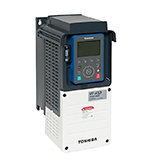 The sensor which is equipped in the machine and equipment, can be connected with VF-AS3 and the status can be monitored by VFD network communication. ・The Advanced Key Pad is detachable, and USB port can be connected with PC for parameter download and monitoring by using maintenance communication software (PCM). ・Optional PROFINET, EtherCAT®, PROFIBUS-DP, DeviceNetTM, CAN open® are available. ・VF-AS3 can meet IEC61000-3-12 without external reactor (THD<=48%) and EMC directive of IEC61800-3 Category C2/C3 (400V Class only). ・Environmental protection is improved for IEC70721-3-3 dust 3S3 and chemical 3C3 (Size A6 or less). ・The safety standards with STO (Safe Torque Off) function, it will be highly reliable to cut-off in the emergency conditions. ・In addition, the safety functions of SS1, SOS, SS2, SBC, SLS and SDI also available as options (under planning). ・Include with the terminal box for UL Type1 (Size A5 below). ・VF-AS3 has sensor / sensor-less position control with Point to point, Pulse input and Orientation, which is suitable for the application such as processing machine for high precision control. ・VF-AS3 can drive not only 3-phase induction motors but also Interior Permanent Magnetic Motor (IPM) and Surface Permanent Magnetic Motor (SPM) with / without feedback sensor.